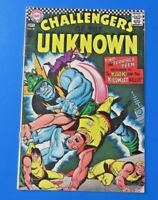 Challengers of The Unknown #58 DC Silver Age 1967!!! Challengers of the Unknown # 55! (1967, DC)! FN5.5-! Silver age DC beauty!